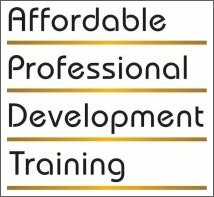 Welcome to Affordable Professional Development Training! APDT is an organisation that has been set up to provide high quality professional development workshops at affordable prices for mental health professionals and other members of the community. Watch this space for an announcement of workshops for 2019! We have come to an end of our programme of workshops for 2018. As many of you already know, I am leaving APD Training in order to concentrate on private clients as well as more retirement activities! The last five years has been a steep but very enjoyable learning curve, and it's been wonderful to meet all our participants and speakers. However, APD Training will continue to provide affordable, high quality workshops and Dianne is already planning the programme for 2019! Thank you everyone for your support over the last five years, and I'm sure I'll see you soon at a future APD Training workshop. I love the vibe of your workshops - they're always so friendly!